The Audi A7 is an executive car produced by Audi since 2010. A five-door liftback, it features a sloping roofline with a steeply raked rear window and integrated boot lid (forming the so-called "Sportback"), and four frameless doors. The Audi Sportback concept is a concept vehicle powered by a 3.0-litre V6 TDI clean diesel engine rated at 225 PS (165 kW; 222 hp) and 550 N⋅m (406 lbf⋅ft) of torque. It features a 7-speed S tronic transmission, quattro permanent all-wheel-drive system, five-link front suspension, continuous damping control shock absorbers, electromechanical steering, ceramic brake discs (380 mm front and 356 mm rear), front 6-piston monobloc aluminum brake calipers, rear floating-caliper brakes and 21-inch wheels. The vehicle was unveiled in 2009 at the Detroit Auto Show. 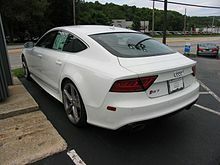 The A7 is in essence, a four door fastback version of the C7-series Audi A6, based on the Volkswagen Group MLB platform. The A7 was released before the more conventional A6 saloon/estate. Both cars share the same core structure, drivetrain, chassis, dashboard and interior, whilst the A7 has its own unique exterior panelwork. It also differs from the A6 in that it uses aluminium for much of its front body structure. The A7 was also the first fastback to appear within the Audi C-platform series since the Avant version of the C2 Audi 100, which was discontinued in 1982. The vehicles went on sale in fall 2010. Early models include 2.8 FSI (204 PS (150 kW; 201 hp)) with multitronic, 3.0 TFSI quattro (300 PS (221 kW; 296 hp)) with seven-speed S tronic, 3.0 TDI quattro (245 PS (180 kW; 242 hp)) with seven-speed S tronic; followed by 3.0 TDI (204 PS (150 kW; 201 hp)) with multitronic. The 2011 model year A7 introduces FlexRay high speed databus that controls all the driver assistance systems from the A8, but it adds head-up display and active lane assist. Full LED headlamps with Automatic high beam switching or Audi adaptive light (Xenon) with variable headlight range control. US models went on sale 2012 model year vehicles. Early models include 3.0 TFSI quattro (310 PS (228 kW; 306 hp)) with an 8-speed automatic transmission. The S7 is a version of the A7 with a 4.0 litres (3,993 cc) biturbo TFSI V8 engine rated at 420 PS (309 kW; 414 hp) and 550 N⋅m (406 lbf⋅ft) of torque, as well as a quattro four wheel drive system and 7-speed S–tronic gearbox. The S7 can accelerate from 0 to 100 km/h (0 to 62 mph) in 4.7 seconds. The vehicle was unveiled at the 2011 Frankfurt Auto Show, and later in 2012 Audi quattro Cup. Delivery of the S7 began in spring 2012. Reviewers have cited the Mercedes-Benz CLS-Class as the inspiration to the Audi A7 in the four-door executive sedan market. The following internal combustion engines are available, with variations dependent on market. In the ICOTY Awards, the Audi A7 was named the International Car of the Year in 2012. AutoWeek magazine named the Audi A7 as the Best of the Best/Car for 2012. Esquire magazine named the Audi A7 as the 2011 Esquire Car of the Year. Automobile Magazine named the Audi A7 "2012 Automobile of the Year". As part of the A7 Sportback product launch, a launch campaign was created in collaboration with the London advertising agency Bartle Bogle Hegarty. The birth story of the A7 Sportback became the inspiration of the Paper Liberation spot. As part of the A7 launch in the US, a papercraft version of 2012 Audi A7 was produced. As part of the S7 launch in the US, a Super Bowl commercial was produced. A7 3.0 TDI quattro (313 PS (230 kW; 309 hp)) (as A7 3.0 BiTDI quattro) was added to the UK market. The A7 3.0 TDI clean diesel quattro was unveiled at the 2012 Los Angeles Auto Show. US model of A7 3.0 TDI clean diesel quattro was set to go on sale in fall 2013 as 2014 model year vehicle. 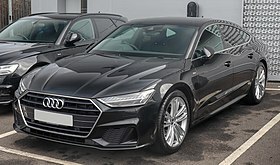 The A7 Sportback Black Edition is a version of the A7 (excluding 3.0 TDI (204 PS (150 kW; 201 hp)), S7) for the UK market. It includes 21-inch rotor-design alloy wheels with a dark titanium finish with further lowered S line sports suspension, black grille and number plate surrounds and the window frame strips, and by privacy glass extending from the B-pillar rearwards; Piano Black inlays, sports seats upholstered in black Valcona leather, black headlining, BOSE audio system with DAB radio and AMI from SE specification and above, S line equipment package (satellite navigation, light and rain sensors, Xenon all-weather headlights and LED rear lights, Audi drive select adaptive dynamics system, Audi parking system plus, keyless go), powered tailgate operation, electrically adjustable front seats and a powered retractable rear spoiler. The RS 7 has a 4.0 TFSI twin scroll twin turbo V8 engine rated at 412 kW (560 PS; 553 hp) and 700 N⋅m (516 lbf⋅ft) of torque, as well as cylinder on demand system deactivates intake and exhaust valves of 4 cylinders (2, 3, 5 and 8), eight-speed tiptronic transmission with D and S driving modes, quattro with torque vectoring with self-locking center differential with a high locking rate and oil cooler (optional quattro with sport differential with two superposition gears), polished 20-inch forged wheels in a seven twin-spoke design (optional 21-inch cast wheels in a choice of three designs), four internally vented diameter brake discs with 390 mm (15.4 in) diameter front discs and black (optional red) painted six-piston calipers (optional 420 mm (16.5 in) carbon fiber ceramic discs with anthracite gray calipers), electronic stabilization control with Sport and off modes, adaptive air suspension lowering body by 20 mm (0.79 in) (optional tauter sport suspension plus with Dynamic Ride Control), optional Dynamic all-wheel steering with continuously variable steering boost and ratio, high-gloss black protective grille with honeycomb structure at the front of the car, add-on parts in matte aluminum, power extending spoiler, two elliptical tailpipe trims, a choice of 10 body colours (including Nardo gray, exclusive finish Daytona gray, matte effect), optional matte aluminum and carbon styling packages, footrest, pedals and soft keys in the standard MMI navigation plus terminal in an aluminum-look finish; decorative trim below the retractable monitor in piano finish, carbon inlays (four optional additional materials), headlining in black cloth (optional lunar silver or black Alcantara), RS sport seats with side bolsters and integrated head restraints and RS 7 logos upholstered in black Alcantara and leather with diamond quilting at center sections (optional honeycomb-quilted Valcona leather in either black or lunar silver), optional power-adjustable comfort seats with memory function, contoured rear seats, xenon plus headlights, a tire pressure monitoring system, the parking system plus, three-zone automatic air conditioning, cruise control, Audi sound system, MMI navigation plus, adaptive cruise control with Start-stop system including Audi pre sense front. The RS 7 can accelerate from 0 to 100 km/h (0 to 62 mph) in 3.9 seconds and is limited to 250 km/h (155 mph). The optional dynamic package and dynamic package plus increase top speeds to 280 km/h (174 mph) and 305 km/h (190 mph) respectively. Other options include the exterior mirrors with exposed carbon housings and the all-LED headlights, head-up display, a comfort package, the dynamic package, the dynamic package plus, Bluetooth online car phone, Bang & Olufsen Advanced Sound System. The vehicle was unveiled at the 2013 NAIAS. 2 are unchanged from the standard RS 6 Avant. Latest Multi Media Interface modular infotainment platform (faster Nvidia Tegra 3 processor, improved graphics) including handwriting recognition. Adaptive glare-free Matrix LED headlights. Improved Night Vision Assistant can now recognize animals. Both TFSI and all three TDI engines now meet the Euro 6 emission standard. The second generation of the A7 was revealed in October 2017, officially launched in Germany in February 2018, and has been on sale in Europe since late 2017 and made its debut for the North American market at the North American International Auto Show in Detroit on 12 January 2018. Production started in February 2018 at Audi's Neckarsulm plant. At launch, the A7 was powered by a six-cylinder petrol engine making 250 kW (340 PS; 335 hp) and 500 N⋅m (369 lbf⋅ft), an engine also used in the new Audi A8. Further engines will follow soon after the start of production. All units will receive a 48-volt vehicle electrical system, which together with the belt alternator starter (BAS) comprises the MHEV system (Mild Hybrid Electric Vehicle). India - The A7 will be launched in India. Bangladesh - The second generation of the Audi A7 will be the first generation of the A7 to be sold in Bangladesh. ^ "Audi Plans Extra Shifts at German Plant as A6, A7 Orders Rise". Automotive News. Crain Communications. 22 March 2013. Retrieved 16 July 2014. ^ Pollard, Tim (12 January 2009). "Audi Sportback unveiled at Detroit auto show 2009". Car Magazine. Retrieved 19 January 2009. ^ "Success for Audi in "Auto Bild Design Award"" (Press release). Audi-mediaservices.com. 15 May 2009. Retrieved 5 March 2013. ^ Abuelsamid, Sam (11 January 2009). "Detroit 2009: Audi Sportback concept, coming soon as the A7". Autoblog.com. Retrieved 5 March 2013. ^ McIlroy, John (30 July 2010). "Paris Motor Show 2010: Audi A7". Autocar. Haymarket Media Group. Retrieved 17 June 2011. ^ Knapman, Chris (28 January 2011). "Audi A6 Review". The Daily Telegraph. Archived from the original on 28 June 2012. Retrieved 17 June 2011. ^ "Live from Munich: World Premiere of Audi A7 Sportback" (Press release). Audi-mediaservices.com. 20 July 2010. Retrieved 5 March 2013. ^ Loh, Edward (19 April 2011). "2011 New York: Audi A7 Available in the U.S. in May 2011, Starts at $59,250". Motor Trend. Retrieved 1 June 2011. ^ "Audi at "Wörthersee Tour 2011"" (Press release). Audi-mediaservices.com. 31 May 2011. Retrieved 5 March 2013. ^ "Audi in New Top Form – the Audi A7 Sportback" (Press release). Audi-mediaservices.com. 4 September 2010. Retrieved 5 March 2013. ^ Ewing, Steven J. (26 July 2010). "2011 Audi A7 Sportback Shows Its Shapely Rump in Munich". Autoblog. Retrieved 5 March 2013. ^ McIlroy, John (26 July 2010). "Audi A7 Revealed". Autocar. Haymarket Media Group. Archived from the original on 28 July 2010. Retrieved 28 July 2010. ^ "Audi USA A7 Brochure". Retrieved 27 February 2012. ^ Shunk, Chris (4 April 2011). "2012 Audi A7 to Start at $59,250". Autoblog. Retrieved 5 March 2013. ^ Kurczewski, Nick (14 September 2011). "2012 Audi S7 and RS 7". Road & Track. Retrieved 24 December 2018. ^ "Audi quattro Cup: Winners Travel to South Africa" (Press release). Audi-mediaservices.com. 7 September 2012. Retrieved 5 March 2013. ^ Glucker, Jeff (13 September 2011). "2012 Audi S7 Saunters Slyly onto Stage, Shows Sultry Shape". Autoblog. Retrieved 5 March 2013. ^ Watson, Mat (8 September 2010). "Audi A7 3.0 TDI". Auto Express. Dennis Publishing. Retrieved 17 June 2011. ^ "Audi A7 Sportback Technische Daten (February 2012)" (in German). Audi.de. Retrieved 5 March 2013. ^ Hindes, Martha. "2012 Audi A7 Named 2012 International Car of the Year by Road & Travel Magazine". Road & Travel Magazine. Caldwell Communications. Retrieved 5 March 2013. ^ "Best of the Best/Car: Audi A7". AutoWeek. 62 (1): 18–19. 9 January 2012. ISSN 0192-9674. ^ Smith, Sam (14 September 2011). "The 2011 Esquire Car of the Year". Esquire. Hearst Communications. Retrieved 5 March 2013. ^ Lorio, Joe (8 January 2012). "2012 Automobile of the Year: Audi A7". Automobile. Source Interlink Media. Retrieved 8 March 2013. ^ "Audi Design's Secret Project: Creation of the A7 Sportback Inspires Advertising" (Press release). Audi-mediaservices.com. 26 November 2010. Retrieved 5 March 2013. ^ Ewing, Steven J. (3 December 2010). "Video: Audi Spraypaints Massive New A7 Billboard". Autoblog. Retrieved 5 March 2013. ^ Shunk, Chris (21 April 2011). "Origami Audi A7 Created Completely from Paper". Autoblog. Retrieved 5 March 2013. ^ Bowman, Zach (26 January 2012). "Audi Lights Up Vampire-laden S7 Commercial Ahead of Super Bowl". Autoblog. Retrieved 5 March 2013. ^ Joseph, Noah (1 February 2012). "Audi Pumps Out New Twin-Turbo TDI 3.0L V6". Autoblog. Retrieved 5 March 2013. ^ "LA AUTO SHOW: Audi Debuts FOUR NEW Diesel Models - Are These Fuel Sippers What You've Been Waiting For? - AutoSpies Auto News". www.autospies.com. Retrieved 15 November 2018. ^ Miersma, Seyth (19 November 2012). "Audi Confirms Four New TDI Diesel Models Headed for US". Autoblog. Retrieved 5 March 2013. ^ Bowman, Zach (6 November 2012). "Audi Launches Black Edition Models in UK". Autoblog. Retrieved 5 March 2013. ^ "Dynamics at Their Most Beautiful – the Audi RS 7 Sportback". Audi MediaServices (Press release). 14 January 2013. Retrieved 16 January 2013. ^ Bowman, Zach (14 January 2013). "2014 Audi RS7 is a 189-mph Terror". Autoblog. Retrieved 5 March 2013. ^ Allan, Lawrence (22 October 2015). "Audi RS6 Avant and RS7 Performance Editions Unveiled with 597bhp". Auto Express. Dennis Publishing. Retrieved 6 April 2018. ^ Pawel Zal (ed.). "2015 Audi RS7 Sportback Performance". Autoomobile-catalog.com. Retrieved 19 August 2018. ^ Audi Communication (22 May 2014). "Sleek And Stylish – The New Audi A7 Sportback". AUDI AG - Audi Communication. Retrieved 30 December 2014. ^ Carney, Dan (26 November 2018). "2019 Audi A7 First Drive: Party In The Back". Motor1.com. Retrieved 17 November 2018. ^ Capparella, Joey (11 April 2019). "The 2020 Audi S7 Gets the RS5's V-6 in Place of Its Predecessor's Amazing V-8". Car and Driver. Retrieved 11 April 2019. ^ "Second generation (2018–present)". www.audi.de. 13 December 2017. Retrieved 13 December 2017. ^ "2019 Audi A7 to Make U.S. Debut in Detroit". CTV News. Bell Media. 12 January 2018. Retrieved 1 February 2018. ^ Ogbac, Stefan (19 October 2017). "2019 Audi A7 Looks Slick and Turns Up the Tech". Automobile. TEN: The Enthusiast Network. Retrieved 5 September 2018. ^ Of, Andreas; Hebermehl, Gregor; Thomas, Jörn; Lang, Patrick (8 February 2018). "Das kostet ein Audi A7 Sportback (2018) mit Vollausstattung: Praxis-Test für das Viertürer-Coupé mit A8-Technik". auto motor und sport (in German). Motor Presse Stuttgart GmbH & Co. Retrieved 13 March 2018. ^ "Second-generation Audi A7 Sportback Features Standard 48V MHEV System with Gasoline or Diesel Engines". Green Car Congress. BioAge Group. 14 February 2018. Retrieved 13 March 2018. ^ "2018 Audi A7 Sportback Revealed". Autocar India. Haymarket Media Group. 20 October 2017. Retrieved 26 June 2018. ^ Rahman, Saurin (25 September 2017). "Audi Dhaka-Progress Motors Imports Ltd, Press Meet and Showroom Launch". Auto Rebellion. Retrieved 12 July 2018.